How your company can support the Wings of Hope children’s charity. Want to be more to Wings of Hope than a single supporter? There are heaps of ways to get involved! By raising awareness you gain support. People are more likely to support something passionately if they KNOW exactly what they are supporting. Tell your company about us! Think about different ways you can raise awareness of our work. Twitter? Tweet about us and your fundraising progress. Feature us – can you use your company newsletter or Intranet? Why not be inventive? Think about how you can modernise and simplify the process of giving. Encourage employees who otherwise wouldn’t get involved. The best fundraising is achieved by organising events that everyone will enjoy! Healthy competition! Organise a lunch tournament with a competitor’s fee. Keep fit! Run a weekly fitness club or organise a sponsored walk, swim or climb. Health walks and sports days are great ways to bring staff and families together. Film Club – Organise a regular film club for your work colleagues. Come Dine With Me – host a dinner party and donate the prize money. Trip to the theatre – could you sell group tickets with a suggestion donation? Coffee and cake sale – everyone loves cake! 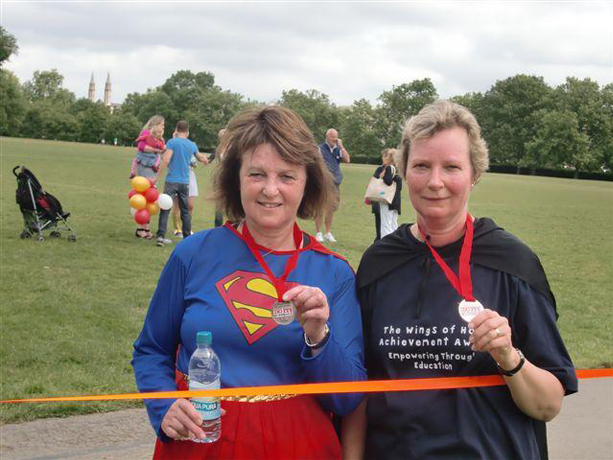 Our events – take part in a Wings of Hope event or find your own! Simplify: there are lots of ways to donate and you can give online in seconds. Advertising – we’d love to tell our supporter about the great work you are doing our Facebook and news page. Resources and information – tell us what you need.